What's most terrifying the electricity industry isn't the threat of price control or a clean energy target or even being forced to keep open power stations that have long since ceased to work properly. It's not even the government's inability to come up with a clear set of rules. It's a fear more primal – the same one gripping the national broadband network, public schools, and private health funds. Analysts at AGL Energy call it "the death spiral". US economist Craig Severance popularised the term six years ago. "In this nightmare, a utility commits to build a very expensive new power plant," he wrote. "However, when electric rates are raised to pay for the new plant, the rate shock moves customers to cut their use. The utility then has no way to pay for the new power plant unless it raises rates even higher – causing a further spiral as customers cut their use even more or walk away. "In the final stages of that death spiral, the utility's more affluent customers have drastically cut purchases by implementing efficiency and on-site (solar) power, but the poorest customers have been unable to finance such measures. The utility is then left attempting to collect higher and higher rates from poorer and poorer customers." It's been playing out in Australia since the late 2000s. Most of each electricity bill is the cost of the network – poles, wires and transformers. The companies that own them are necessarily monopolies, often government-owned. What they can charge is regulated, but since the late 2000s, regulated to their extraordinary advantage. It's a cost-plus arrangement. The monopolies forecast demand every five years, estimate how much they will need to spend to meet it, add a margin, and get a tick from the Australian Energy Regulator. If it doesn't give them a tick, they can appeal to the Australian Competition Tribunal which has given them more on 31 out of 52 occasions and has never given them less. At the very end of the 2000s the network monopolies forecast big increases in demand and even bigger increases in their investment programs to cope, so-called "gold plating". It allowed them to demand big price rises. That mightn't have been that much of a problem had demand actually climbed as they forecast. Instead, in 2010, for the first time in history, electricity use fell. At first it looked like a response to the global financial crisis, but it wasn't limited to industry and it didn't stop. In 2010 demand per residential customer slid 4.4 per cent in NSW and 0.7 per cent in Victoria. Then 2.1 per cent and 5.4 per cent, and so on. Seven years on, NSW consumers use 17 per cent less than they did in 2009, Victorian customers 15 per cent less. The curious rules governing the regulator allow the monopolies to charge more per customer each time their customers use less, to recover the same amount. We've not only been switching to fewer devices, we've also been putting in solar panels and, increasingly, batteries. So far few of us have left the grid completely, but a downward spiral could start nonetheless. Economists call it "adverse selection". The customers that remain are more likely to be poor, either renters or owners without easy access to finance. As prices rise and even those without good finance find it worthwhile to escape, those who remain get poorer still, and are charged still more. Tony Wood of the Grattan Institute, who wrote a report on this in 2013, says there's no obvious way out. In a proper market, a business that produced such appallingly inaccurate and self-serving forecasts would fail and be taken over by firms that could charge less. But there's nothing free about the market facing the monopolies, as Energy Minister Josh Frydenberg knows full well. He is trying to abolish their right to appeal to the tribunal, which would be a start. 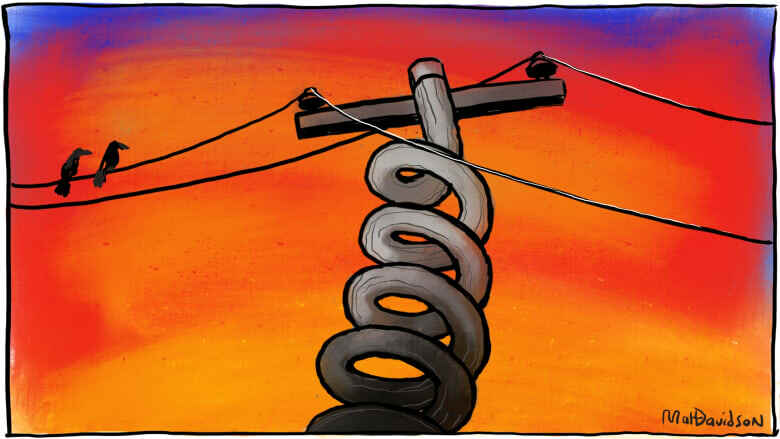 Competition and Consumer Commission chief Rod Sims told the Press Club on Wednesday that network charges were by far the biggest driver of electricity price increases, accounting for 41 per cent. Retail margins account for 24 per cent, generation 19 per cent, and green schemes 16 per cent. Yet it's the green schemes about which our leaders most often speak. Getting to grips with adverse selection is hard, but essential. The national broadband network is about to face it big time. Costing billions to build and having to charge billions to break even, for many city users it'll be uncompetitive with 4G and 5G. As they go wireless, it will have to charge more to those who remain, and so on. It's a design flaw. Private health funds face adverse selection too. As their fees go up, they lose healthy customers who find them poor value, and have to charge even more to the less healthy, who also leave, and so on. And public schools. They're losing the good students, leaving behind those that are harder to teach, making classes harder to teach and encouraging still more good students to leave. It's not only the electricity industry that wants a way out.